March 22, 2019 – If you missed our March Appetite for Life presentation by Johanna Lampe, PhD, RD, you can catch up. Watch the entire program on video now. The live presentation took place at Forty-Six in Kannapolis on Wednesday, March 13, 2019. Trillions of microorganisms live in our gut. This microbiome has 100 times as many genes as the human genome, and yet, scientists are only now beginning to understand what the importance is of the symbiosis between the human host and its microorganisms. 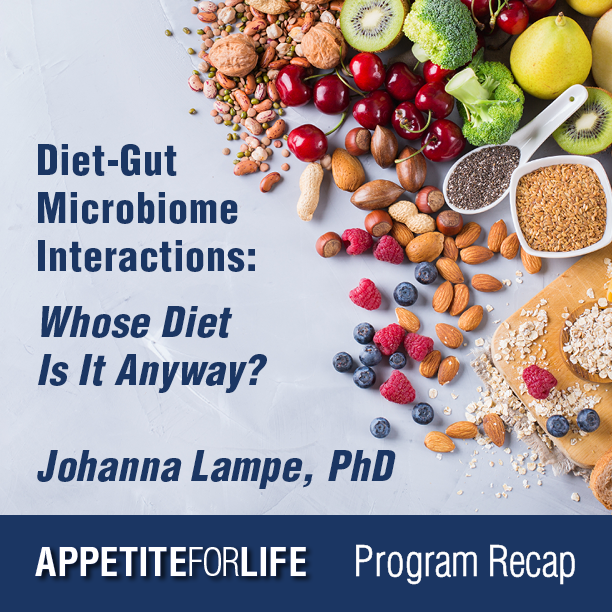 In her fascinating talk, Diet-Gut Microbiome Interactions: Whose diet is it anyway?, Dr. Lampe explores the various types of microbes and their functions. We learn that each of us has a gut microbial community specific to ourselves and that in healthy adults our gut microbiome is relatively stable. But the microbial community is modifiable by a variety of factors including diet, pharmaceuticals, stress, geography and stages of life. Why is the condition of this microbiome so important? Because it generates compounds that can cause or reduce inflammation, can be carcinogenic or chemoprotective, and can regulate metabolism. There is also now strong evidence of a gut-brain axis that affects everything from feelings of satiety to quality of sleep patterns. Learn all about this interesting, rapidly evolving area of research by viewing the video here.